MRI machines are extraordinary tools for studying brains, but they aren’t often used on animals unless they are sedated. Why? Because keeping them still often proves to be quite a challenge! Fortunately though, scientists from Emory University were able to train a group of dogs to lie still long enough to successfully perform MRI scans. The purpose of the experiments was to determine which parts of the brain were most active when the dogs responded to signals that they associated with rewards (in this case, hot dogs). The first study1 included only two dogs, but subsequent studies2,3 expanded with 11 more dogs. All were trained to both lie in the MRI machines and recognize the experimenters’ hand signals. One hand signal indicated that the dogs would receive a hot dog reward, while the other hand signal indicated that the dogs would not receive a reward at all. The scientists recorded the brain activity that occurred when each hand signal was shown to the dogs. The scans showed that there was significant activation of the right caudate in all of the dogs when they were shown the hand signal indicating a treat reward. The region was less likely to be activated when they were shown the hand signal indicating no reward. The dogs reliably exhibited positive responses when they believed they were going to receive a reward. These results are very similar to those of a similar experiment done on humans.6 “The results are showing that dogs, and probably most animals, have brains and minds that are far more sophisticated than we ever gave them credit for.” – Study lead Gregory S. Berns, PhD. 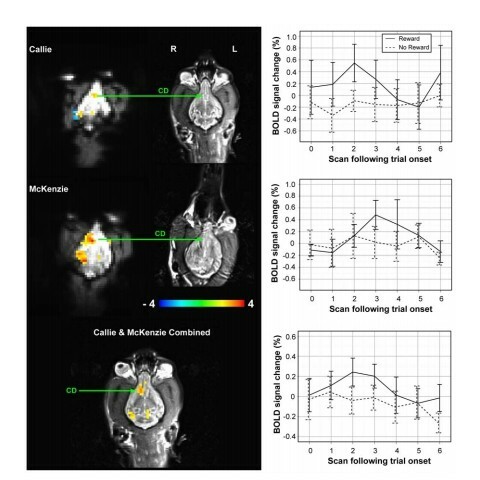 “Although we chose a simple instrumental conditioning task to demonstrate the feasibility of canine fMRI, a wide variety of future studies is now possible. Dogs have had a prolonged evolution with humans, and they are uniquely attuned to our behaviors. For example, one might reasonably ask to what extent the dog mentalizes the minds of humans. Dogs are intensely visual and pay attention to our facial expressions and where we look and point. How do they represent these actions? How do dogs distinguish humans, and is it by vision or smell? Is human language processed as arbitrary sounds, or do dogs have neural structures that respond in a deeper manner to language? What is the difference between how dogs represent humans and other dogs or animals? The questions are endless. Neuroanatomy of Reward: A View from the Ventral Striatum. Neurobiology of Sensation and Reward. Why do we have a caudate nucleus?